Click my poster to see full version. Today, the New York City College of Technology, CUNY (City Tech) hosted its 12th Annual Poster Session for Faculty and Student Research. I presented my poster, “Transformations of ‘Cyberspace’ Across Media,” as one of the over 100 other posters in the event. My poster abstract sketches the project that I am currently developing: In this research project, I explore how the concept of cyberspace transforms based upon the medium in which it is expressed. Specifically, I focus on the term’s explication in William Gibson’s Neuromancer as a printed artifact (1984), video game developed by Interplay (1988) for multiple personal computing platforms, and eBook produced by the Voyager Company for the Apple PowerBook platform (1992). I examine the term’s transformation as originating in typewritten text, developing in an interactive game, and finally, joining print and computing in one of the first mass-marketed eBooks. 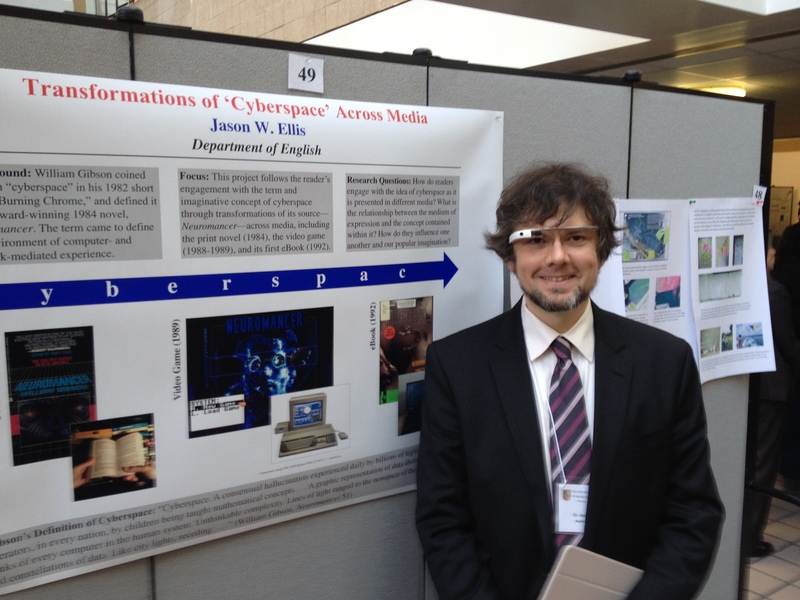 At the Poster Session, wearing Google Glass. 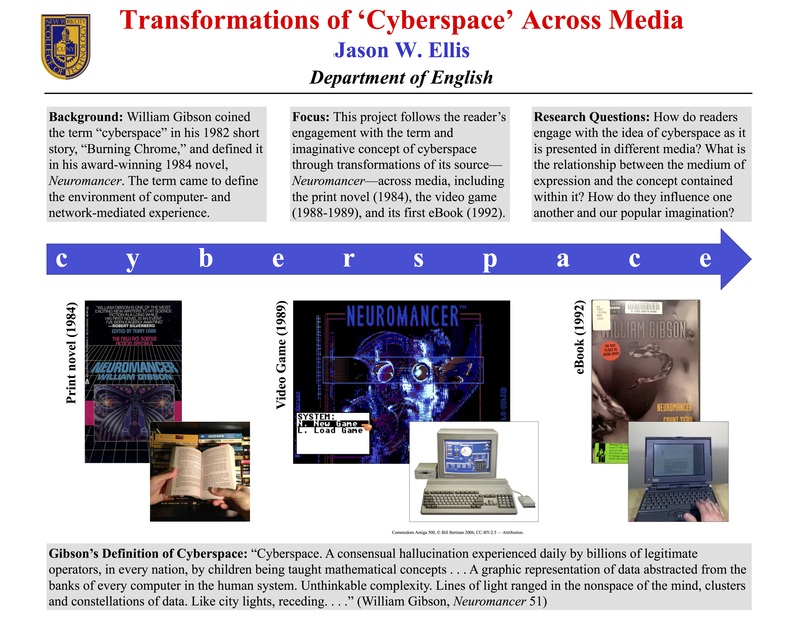 After having the opportunity to talk about my project with colleagues and students during the poster session today, my ideas began to crystalize further about the trace of meaning that I am following in the ‘cyberpunk’ term as it appears in these early forms, transformations, and remediations of William Gibson’s Neuromancer. In particular, I am thinking about how each medium adds to the term’s meaning, but I am also thinking about how these media subtract from the term–each in its own way. For example, the novel’s imaginative possibilities are visually realized in the interactive video game. The promise of the original story is made more real within the platform described by the term. However, the ebook confronts the reality of computing technology in the early 1990s and reveals the concrete limitations of the imaginative concept as it was presented in the novel and video game. Yet, it does this while illustrating other possibilities–perhaps more mundane but nonetheless important and interesting–that were not explored in the two earlier forms. I am developing the ideas behind this poster into a publishable essay that I hope to have completed in the coming months and sent out for review.